Please do not buy your own materials to try to save money! We will just have to charge more labor to compensate to pay our overhead! Also, you do not know what quality product that you are buying! Most companies sell 2nds or even 3rds to the public. We will not warranty materials that you supply? Do we make some profit on materials that we supply? Yes, that's where you get a warranty on the job and keep our shop open, so when you need us to warranty our work or need a job done, we will be there for you to find us! Mobile headliner trimmers might sound convenient or cheaper ( no overhead), see how convenient it is when something is done wrong or is falling apart months later, you can't take it to that shop to have it repaired and good luck on them returning to do anything about the problem!! We have rent, power bills and everything else that comes with having a place of business. PLEASE read this part carefully! COST OF A JOB! When you are given an estimate or price on a FULL INTERIOR, understand that EVERYTHING that you ask us to do after the original price, will be upcharged to your bill! This seems to be a VERY common misconception. If you add more labor/ materials by asking us "can you make this also? Or complicate the design by changing to a harder design, you WILL be upcharged! If we give a "ballpark" or a guesstimate price, (example... ($10k- 12,000 ) that does not mean that you're final price will be $10k!?). •Prices over the phone or by pictures, these are guesstimate prices, not the final, set in stone prices. It is always best for us to look at the job in person ( so we can see what we are starting with, padding repair, springs broken etc. ). Also, because a customer might think something is not in bad condition, unless you do this for a living, you don't know what to look for to give this assumption. All we want to do is give EVERY customer the best job at the cheapest price! Win-win situation! Also "cheap or expensive" depends on what the customer personally thinks is cheap or expensive! $195 is a great price on a headliner in a F-150 extended cab truck, some people think that is expensive! WE DO NOT CHARGE TAX on any jobs, we are a service and only sell our services. If you are going to compare prices then compare the quality also!! Looking for the cheapest price? We are not the interior shop for you! If you want the job done properly ( high quality materials, the job done by a very experienced trimmers, NO SHORT CUTS, the job done in a timely manner ) we are the shop for you! Also, we warranty our work, if you were to have a problem, it's not a problem, we will make it right and correct the issue! Gary's Auto Interiors is a 4th generation auto interior shop, owned and operated by Gary Thomas and his son Brian Thomas. We rely on word-of-mouth as our primary source of advertisement, therefore we take great pride in our work and do each job to the best of out ability. The most important thing that we want out customers to understand is that if you are going to compare the prices of other trim shops, make sure that you also compare the quality of work. If another trim shop is doing work cheaper, there's probably a good reason they are able to do that. Remember that everyone is in business to make money so if something is cheaper chances are that they are either using cheaper materials, paying inexperienced employees lower wages, or spending less time to get the job done correctly. Each year we redo an average of 6 to 8 complete interiors that have come from other trim shops. It ends up being cheaper in the long run to just have the job done correctly the first time. 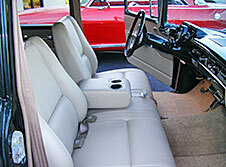 Here at Gary's Auto Interiors we take great pride in our work and treat each vehicle like it is our own. Feel free to stop by and see our work and we will write you an estimate at no charge to you. We hope we get a chance to make you a happy and satisfied customer! We are conveniently located 15 minutes south of Atlanta, Georgia.